Create an inviting look in your yard or landscaping using the Whitehall Garden Poems "Welcome" Plaque. 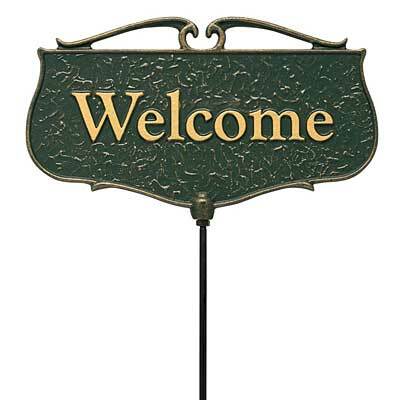 The center of this marker reads "Welcome" in large, gold colored letters, cheerfully bringing friends into your yard. Curved metal bars at the top and rounded corners create exciting shape on the piece, while the forest green color adds a natural tone. Gold colored highlights throughout the textured background bring interest to the sign, and create a slight shine on it when in sunlight. The recycled aluminum construction forms a lasting marker, and the included 16.5" long mounting stake enables it to be placed within your flowers or near your door. Bring visitors into your garden using this Garden Poems "Welcome" Plaque.